Marilia November 06, 2018 Comment? Hello, Noomi fans! Noomi Rapace has been set to star in thriller The Secrets We Keep, which has swedish fallow actor Joel Kinnaman in talks to join. Yuval Adler (Bethlehem) will direct; script comes from Ryan Covington. Rapace will play Maja, a woman rebuilding her life along with her husband Dobie in New York after WWII. When they encounter an eerily familiar man their life starts to unravel. They wonder, could this be the officer who was one of their chief tormentors at concentration camp Birkenau all those years ago? Shoot is due to get under way early next year. Marilia July 21, 2018 Comment? Amazon and “Tom Clancy’s Jack Ryan” are showing their first episode at Comic-Con today but the real explosion may be the addition of our Noomi Rapace to the second season as the executive producer and co-showrunner Carlton Cuse announced at Amazon’s mega-panel in Ballroom 20. Deadline — The BAFTA nominated actress will play Harriet “Harry” Baumann in the currently filming next round of the big play by the House of Bezos. The female lead character is described by Cuse as a “formindable” agent in Germany’s Secret Intelligence, who meets up with Kransinski’s Ryan in South America. Set to launch its first season on August 31, the Wendell Pierce co-starring and Graham Roland co-showrun Jack Ryan was renewed for a second cycle back in April. 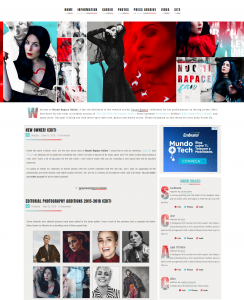 Noomi Rapace Online Has A New Look! Marilia June 12, 2018 Comment? Hello! My name is Marie, and I am the new owner here at Noomi Rapace Online. I would like to start by thanking Frederik and Flaunt for allowing me to adopt this wonderful site, which I’ve been a big fan of for many years now! I’m really excited about taking it over, and I have a lot of big plans for the site which I can’t wait to share with you all, including a new layout that will be lauched tomorrow. I’m going to merge my collection of Noomi photos with the current collection that the site has, and I plan on upgrading all the photoshoots and event photos with higher quality versions. All I ask for is a teensy bit of patience while I get it all ready. You can follow our twitter account for all the latest updates! Frederik March 25, 2017 Comment? In the past few weeks, I have worked behind the scenes to bring a new, mobile friendly video archive to Noomi Rapace Online. The old one has stopped working a while ago on mobile devices, so I’m happy to finally launch the new archive. All the clips from the old archive are uploaded and lots of new clips have been added as well. From Noomi’s first appearance on the Swedish soap opera Tre Kronor to the December-releasing Netflix thriller Bright, all of her projects are covered with trailers, featurettes – as well as talkshow appearances, awards ceremonies, news appearances and television specials. My thanks to MonicaN for providing the plugin. Enjoy! Frederik September 20, 2016 Comment? Welcome to the new version of Noomi Rapace Online. The new layout is a much-needed change for the site, which has seemed to take a bit of a winter’s nap. Fans and frequent visitors might have noticed that not much is happening, although Noomi has completed a batch of projects. Unfortunately, the majority of them (Rupture, What Happened to Monday?, Unlocked) are still awaiting a theatrical release, and it looks more like any or all of these films will make their way to on-demand rentals instead of a theatrical release. “Unlocked”, for example, has been filmed 2 years ago, and even with a director of Michael Apted’s caliber and Rapace, Michael Douglas, Orlando Bloom and Toni Collette’s star power, the film is yet awaiting any kind of release. Another project, “Callas” hasn’t moved an inch since its announcement in Cannes last year. Ditto the Amy Winehouse biopic, although at this stage I doubt it has been officially announced. So, the best way to to overcome this rather dry period is to stay positive and wait for news about the new projects being released. In the meantime, enjoy your stay and the new (and mobile-friendly) Noomi Rapace Online. Welcome to the new version of Noomi Rapace Online, featuring a stunning portrait of Noomi, surrounded by one of her memorable on-screen characters. I hope you enjoy the new look as much as I do. The last layout kind of put me off tracks, or maybe it was the fact that there hasn’t been a new film in 1 1/2 years. But there’s news in sight, with both “The Drop” and “Child 44” to be released in the Autumn and five films in production. So there’s a lot to look forward to. All the site content is still up with the gallery and video archive up to date to the new layout. Enjoy browsing around and make sure to check back soon.